OH whoops I totally forgot to include him too... jesus that group LOL! soO would need to go trough terrans, and looking his recent form vs T i'm not sure he will make it. i think sos is probably fine against terran. losing to maru and innovation isn't a big deal to anyone except serral, and losing 2-1 to bunny isn't really the end of the world either. he also wrecked maru twice in the last quarter of 2018. You cannot judge the form of sOs by his games against Maru(no matter the result). Team games were always tricky in KeSPA teams because the players know each other very well. Its gonna be so sick.. just marked it my calendar.. missed SC2 so much..
My god this tournament is gonna b insane. Who cursed Neeb that he gets Maru in his group again? Good chance Koreans just dominate and take all the spots though. I bet on Stephano to take out Showtime and hero with that new Swarm host nydus meta. I don't think the meta is popular in Korea and so I think it will surprise hero, and then just decided to bet on his vs showtime. 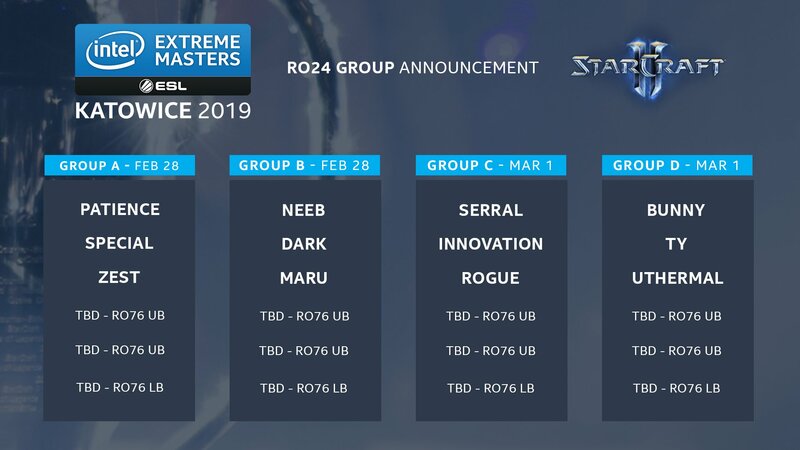 HSC, Blizzcon and GSLvTW (sorry for that acronym) would point to the latter, but I could see Neeb an Reynor being tournament contender, I feel like Showtime is to standard at the end of the day. I wasn't this hyped since Blizzcon! Shaping up to be a great tournament! Blizzcon is more prestigious but IEM Katowice is the actual hardest tournament of the year. Pretty much every professional player attends. Also if Serral wins this he's the B-word no question. But there's no way he's winning it. No one stays on top for that long in SC2. Actually if either Serral or Maru wins this its continuing an age of unparalleled dominance. No one has dominated as hard in Korea as Maru in 2018, and no one has dominated as hard internationally as Serral in 2018. Wow does it really start at 11 am CET?